Preheat broiler and cook sausage 5 minutes per side or until completely cooked. Slice sausage into ¼ inch thick pieces and arrange in a single layer on a baking sheet and broil another 2 minutes to get them nice and brown. Cook pasta according to package directions. Heat oil in a skillet and add pepper and garlic and sauté then add tomatoes, salt, pepper, basil, oregano and onion powder and cook 5-7 minutes. Add sausage and cook another 5 minutes. Garnish with cheese and basil. 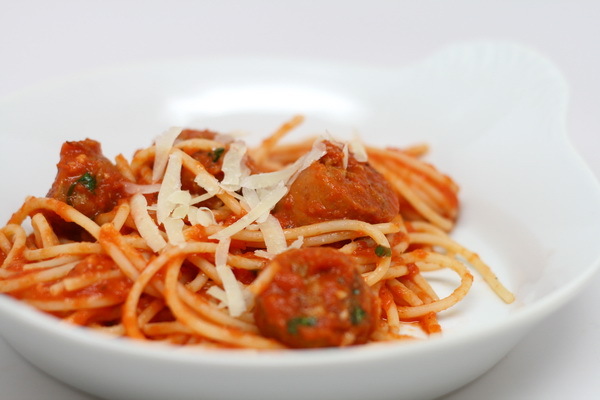 Want a great quick lunch or a perfect appetizer? 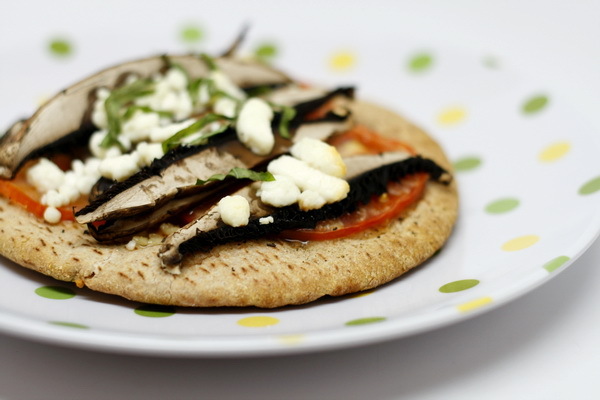 Try one that you are seeing at all the lunch cafes – a goat cheese pita pizza. This one adds and mushroom and tomatoes for an out of this world flavor. Preheat oven to 350 degrees. Mix together the garlic and oil and then brush over the pitas. Add tomato slices and mushrooms then sprinkle with the cheese then with salt and pepper and place on a baking sheet. Bake 15 minutes. Sprinkle with basil when done cooking. Great chops grilled to perfection ! The Hawaiian marinade is world class. 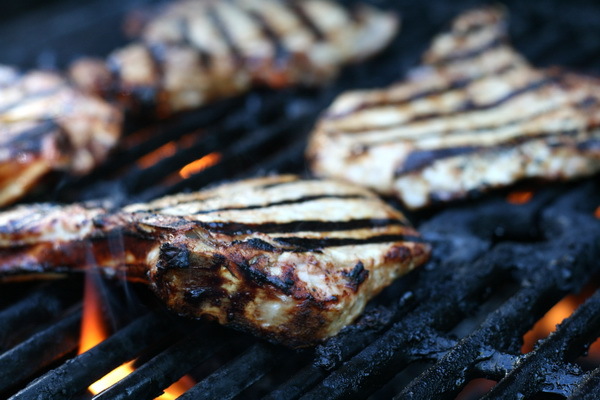 Prepare marinade and let pork chops marinate for at least ½ hour. Heat grill and cook pork chops until done. Hot turkey and gravy out of the oven are good enough along – but add in bacon and cheese and you definitely have a winner ! I can’t believe this is only 293 calories – it tastes so decadent. Preheat broiler. 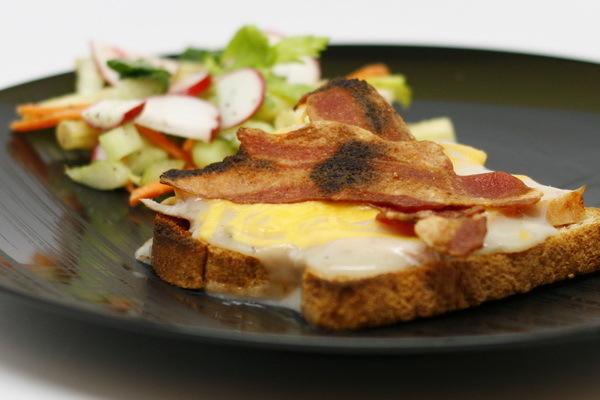 Lay toast on a baking sheet and distribute turkey slices among bread. Mix water and soup and heat thoroughly. Spoon heated soup over turkey and sprinkle with the cheese and then top with bacon. Broil 3-4 minutes or until cheese is melted. 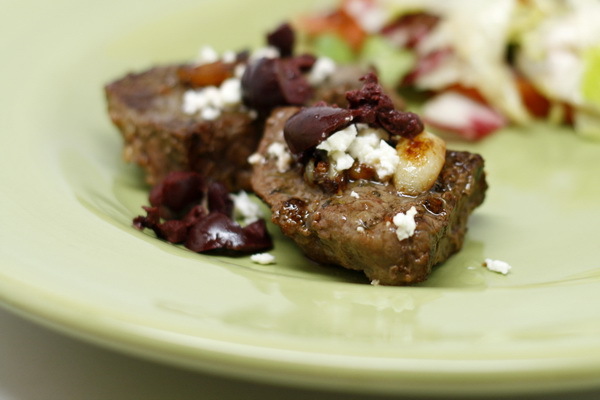 Steak cooked to perfection with added Mediterranean flavors of lemon, garlic, feta cheese, and kalamata olives. What a meal ! When preparing steaks stovetop, I like to use a cast iron pan – I find it distributes heat the best and puts a nice sear on the outside of the meat. Sprinkle both sides of the steak with the oregano, basil, salt and pepper and rub into the meat. Heat oil in a skillet and cook garlic quarters 1 minute. Then add minced garlic and cook another minute then add the steaks and cook 8-10 minutes each side or until desired doneness. Remove from heat and sprinkle with lemon juice and garnish with feta and olives. Cut each steak in half before serving. 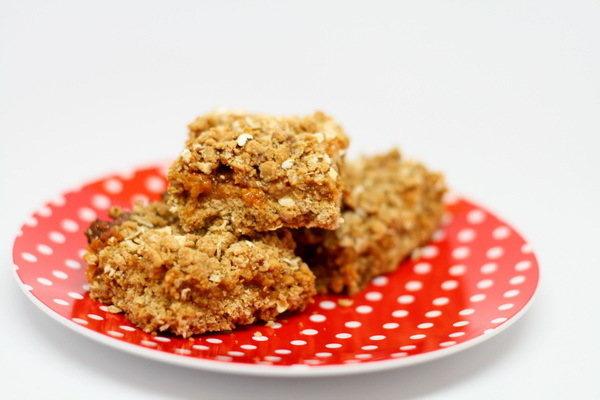 Sweet, chewy, yummy Butterscotch Bars that the whole family will love ! Preheat oven to 350 degrees. Mix sugar and butter with a mixer until light colored and then stir in egg and vanilla. Mix flour, oats, salt and baking soda then add this mix to the sugar mix stirring with a fork until combined. Spray a 13×9 baking dish with Pam and then take 3 c of the oat mix and press it into the pan making a crust. Heat morsels and condensed milk until morsels are all melted and then stir in nuts. Spread this mix over the crust and then sprinkle with the rest of the oat mix. Bake ½ hour or until golden brown. When it comes out of the oven, loosen the edges with a knife and then let cool completely before cutting into bars. B A C O N. Bacon makes everything better and this is no exception. So tasty ! Preheat broiler. Cook bacon until crisp then remove from pan, cool and crumble. Add shallots to bacon drippings and sauté 4 minutes. Add sprouts and 1 c water and bring to a boil then cover pan loosely with some foil and continue cooking 6 minutes or until tender. Add salt and pepper and mix. Melt butter in a small pan and add breadcrumbs and some salt and sauté to toast the crumbs. Add bacon crumbles to breadcrumbs. 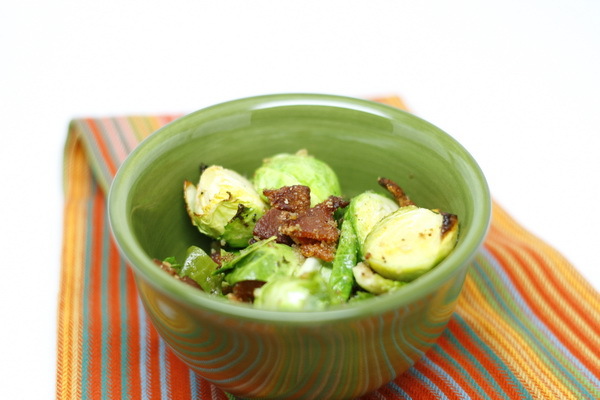 Turn sprouts into a baking dish sprayed with Pam and sprinkle with the breadcrumb mix. Broil 3 minutes. You can’t get a potato chip fresher than this. In just a couple of minutes you have a perfect snack size serving and they are sooooo good. I don’t even peel the potato first. 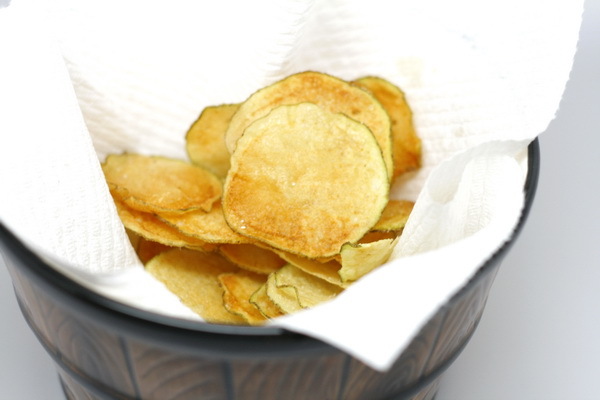 Slice potatoes super thin (I use a mandolin to do this – just be sure to user the guard !). Mix slices with oil and salt. Spray a glass dish with Pam and spread a single layer of potatoes on the plate. Microwave on high 2-3 minutes or until they start to brown. Turn and microwave until they start to crisp around the edges (another 2 minutes or so). Work in batches. Cool completely. 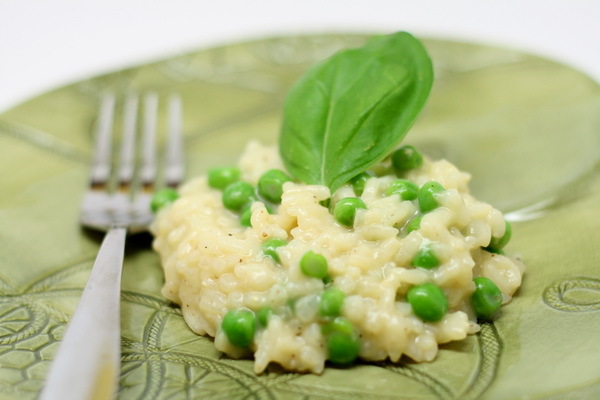 This consistently turns out an awesome risotto textured dish yet takes so little time to make ! Be sure to use Arborio rice or it just won’t turn out tasting like risotto. Heat butter and cook shallots until tender. Add rice and cook and stir 2 minutes. Stir in water, flavoring, salt and pepper and bring to a boil. Then reduce heat, cover and simmer 20 minutes. Stir in peas and let stand covered 5 minutes. If not a creamy texture, add in some water. Finally stir in parmesan cheese. Sometimes baking prepared pasta and sauce makes it taste like a whole different meal – and when you add in a layer of decadent cheese, then it really feels special 🙂 This is super easy to do and tastes GREAT ! Heat oven to 350 degrees. Spray 8 inch baking dish with Pam. Cook pasta according to package instructions. 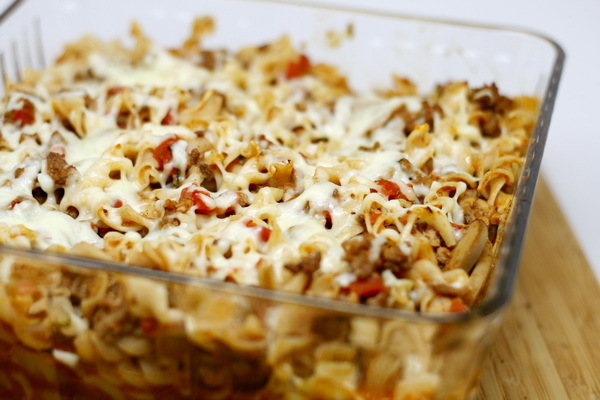 Brown ground beef and drain then add tomato sauce, tomatoes, mushrooms herbs and spices and bring to a boil them remove from heat and stir in pasta then turn into the baking dish and cover and bake 15 minutes. Then uncover and sprinkle with cheese and bake another 5-10 minutes.